SAM’s School & Educator Intern Hailey Hargraves treds lightly on Carl Andre’s Lead-Aluminum Plain. Hello all! Our names are Hailey Hargraves and Sara Portesan, and we have spent the past three months as interns in the Education Department here at the Seattle Art Museum. In light of our time here, which is sadly coming to an end, we decided to interview each other and give you (the delightful and dedicated reader) a better idea of both ourselves and our roles here at SAM. If you could borrow (with permission!) any one piece of artwork from the Seattle Art Museum, which one would it be and what would you do with it/where would you put it? Sara: Probably a sculpture, like Do Ho Suh’s Some/One, the “dog tag suit.” I really want to touch it and walk inside of it, lift up a corner to see how heavy it is and see how the dog tags are held together, which is not allowed in the museum. Is that bad? Hailey: I want one of those cars from Cai Guo-Qiang’s Inopportune: Stage One piece and I would put it in my living room. Of course, I don’t actually know how to get it out of the museum and it would take up the whole living room. That is, if I even had a living room…which I don’t. Sara: While at the museum, I did some research for the Luminous: Art of Asia exhibition’s Outreach Suitcase. I loved the Seattle Asian Art Museum’s Volunteer Park library. It was full of books on Asian art…what more could you ask for? Hailey: I spent the majority of my time working with the eMuseum collection and compiling pieces of art that correlated with existing school tours for the permanent collection. 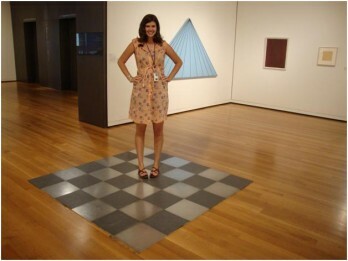 As a result, I could play in the galleries and it was considered research! Based off of your experiences at SAM, what does your future look like after college? Sara: I still really don’t know, but I’m glad I was able to see more job positions relating to art. I could definitely see myself traveling or working abroad, although I’m not exactly sure what sort of job that would turn out to be. Hailey: What I really want is a job after college and people to stop asking me what I plan to do with an art history degree. Essentially, I would love to work in a museum or any place where I could be surrounded by art. What do you like most about your desk space? Sara: The posters were the most noticeable, but the phone was probably most memorable because it always read “New Callers: 100,” but I’ve never heard it ring. Hailey: I really liked all the past exhibition posters which were used for decoration, and especially this one picture of Andy Warhol with the quote, “I think everybody should like everybody.” I’m also a huge fan of the legal note pad I use to make lists. If you could be any type of dip, what would you be? Sara Portesan attends Whitman College and is preparing to spend her junior year abroad in Kyoto, Japan. Her interests include Japanese calligraphy, drawing, and ferrets. Hailey Hargraves attends Smith College and is preparing to spend her junior year in Washington, D.C. and in Athens, Greece. Her interests include gardens, ancient architecture, and glitter. 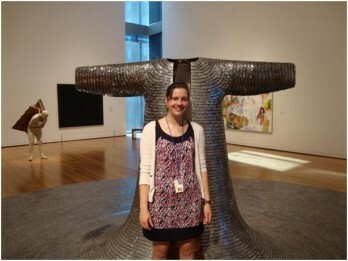 Top photo: SAM’s School & Educator Intern Sara Portesan in front of Do Ho Suh’s Some/One.